A few months ago my wife and I felt compelled to assist the Refugee Crisis. Like most of the country we were horrified to see pictures of a young Syrian child washed up on a beach and it drove us to action. I put pen to paper and wrote “Refugee Crisis! What must we do?” . This blog was widely shared in the community and through it I was introduced to Torfaen Aid for Refugees (TAR). After a few Facebook messages we agreed that Noddfa Baptist Church would become a collection point for the North of Torfaen. We were inundated! Many from the community had donated, we even had people come up from Cardiff as their centres were full. It was wonderful and humbling to be a part of such acts of kindness. It compelled me further to see this through on behalf of the community that the Lord has called me to serve. So, I volunteered to take the donations to Calais. The work had only just begun! A few weeks later a group of local volunteers collected the goods from the church. The clothes had to be sorted into type and sizes, bagged and labelled. All to ease distribution at the other end. Each week my wife checked in with the distribution centre as well as local/national news to see when was the best time to go. Meanwhile the items for women and children were taken by TAR to Manchester and shipped to where they were needed most, on the borders of Eastern Europe. In light of the Paris attacks (see blog Pray for Paris – What does this mean?). We decided that now would be a good time to depart for Calais as security was on high and the distribution centre had space! I picked up the van early on the Thursday morning and drove to Thornhill Community Centre (Cwmbran) where the donations, once sorted, were stored. I met Mark Price (who heads up TAR) and Dave Daniels (Councillor for Lantarnam), who kindly helped to fill up the van in what seemed to be a monsoon, we were soaked through. Then off to Newport to pick up donations from local company “Global Business Intelligence (GBI)” who were also supporting the trip alongside TAR and members at Noddfa Baptist Church. The CEO of GBI, colleague and friend, Lee Williams, joined me on the journey. We made good progress on the motorway and arrived in time at the Eurotunnel, I was very impressed by its efficiency. In France the rain was still pouring down. The depot was just 10 miles from the Eurotunnel but it took hours for us to find it. We asked many people for directions, to my surprise few spoke any “Anglais”at all. We asked one young man “Thomas” who happened to be Australian. He was just coming back from “the Jungle” where he had been teaching the Refugees English and was walking to the distribution centre. It was dark by this time and still raining; he jumped into the van and directed us. We got to the centre at 17:30, relieved to find it open. There was no time for pleasantries, the volunteers were working hard, a few came out to assist as we had a huge transit full to bursting. They showed us where we could collect roll cages from and where in the warehouse to drop certain things off. The picture above, does not do the scene justice! The warehouse was vast! Lee referenced the warehouse scene of Raiders of the Lost Ark and he was not far off. We unpacked the van into different cages for; clothes, bedding, shoes, coats, towels, non-perishable food, toiletries, tents, cooking equipment and miscellaneous. We then worked to get them to the right places in the distribution centre. It was an eerie place to be. I felt I was on the set of an apocalyptic movie, where the last of humanity were rallying together. Volunteers were working so hard, unified in a common cause, yet little was said in light of the tragedy that lay just 10 minutes drive away from us. There were huge mountains of much needed winter clothing that could potentially save many lives. But to us, we were simply sorting out peoples old clothes. It was a sombre moment as we came to terms with our own perceptions of such goods. To us, they were leftovers, junk, things we did not need in our excess, but they were going to people who would view such a coat as a matter of life and death this winter. I spoke with several volunteers and it warmed my heart to see so many from other churches. I asked them about the “Jungle” and shared my desire to see the church within it. They all looked shocked when they realised I meant tonight, but did say it was perfectly safe. I asked Thomas to be our guide and he was happy to venture back in. We entered the Jungle and I instantly regretted my decision to go. Nothing could have prepared me for the desolate squalor that was set ahead us. Instantly we were greeted by a harsh, deep, pungent smell which I am sure would have been worse if the days torrential rain had not washed a lot of the effluence away. We drove in and up a stone path, to my surprise, within the huts were shops, hotels, mobile phone charging centres, free houses and places to rent bicycles. I managed to take a few pictures on my phone as we slowly drove through, before being warned by Thomas not to take pictures. “The men in the camp would rather not have their pictures taken and can get quite aggressive if you do”. So away went my phone! Just as well, as we drove further in towards the Afghanistan district of the camp, some trouble had just happened and a crowd of people were gathered. We had no choice but to drive through them, our guide got out in front to ask them to move aside. At one point we were totally surrounded, a conservative estimate would be around three hundred men in the road, many shouting “line, line?” Essentially asking whether the van had donations and should they queue? We continued to drive on. The strategy was clear, someone volunteered to purposely walk slowly in front of the van (to slow us down) why others tried to open the back. As we came straight from the distribution centre I forgot to lock the van door and could feel the vibrations under my seat of footsteps behind me in the truck. I was terrified. We were in a transit, in a separate cabin at the front, so relatively safe. 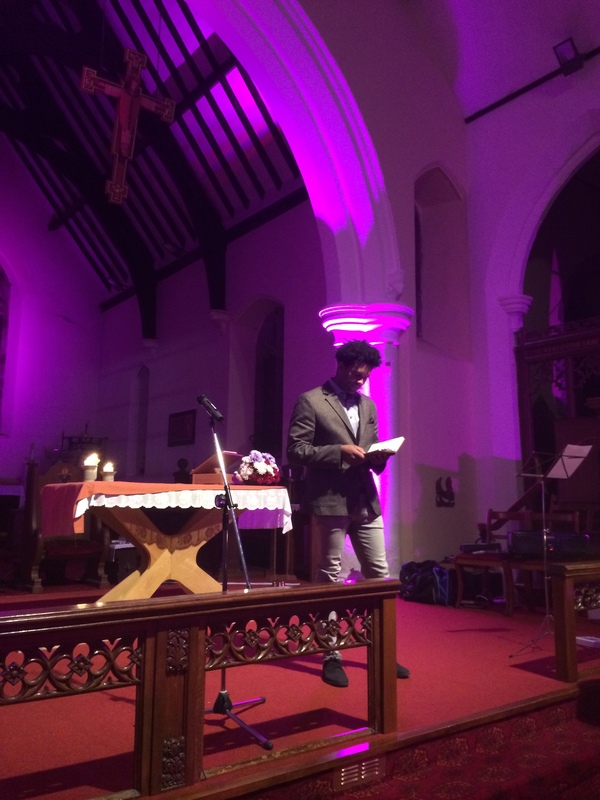 I pushed on through to the church, rather than getting out there and then. We parked up, got out and opened the back doors, telling everyone to get out. To my relief they all had smiles on their faces as if it was just a joke, a bus lift to the top of the hill. To my disappointment, the church was locked owing to the previous incident that caused so many to gather further down the path. Our guide walked off and started speaking to various gangs of people, explaining that I was a Pastor of a church in Wales and would like to go inside. Many made calls to find “Solomon” who had the key. We were told to wait for ten minutes. Many people came to the van asking “line, line”? Others walked right up to us to see what we were wearing. (Lee regretted coming in Gucci shoes and a Ralph Lauren shirt). Most of them spoke English (better than the French people we asked for direction when in Calais). They told us that their main need was for footwear, the ground was simply wet mud and stone, their shoes were getting chewed up. I spoke to others who said they were Christian, I said I would pray for them and asked for their names. A number walked past us to pray quietly at the doors of the church. I am pleased to report that nobody that we saw there was emaciated. I also saw several women and one boy around ten years old. There maybe more but it was night time and many would have been in their tents, so unsure of the real demographic. Certainly male dominated. We were told of the tear gas that they claim the French Police had been using on them and that 200 tents had burned down days before, so morale was low. We had also heard that some volunteers had set up a free canteen for residents, but this week it had been held up three times (it is assumed by the owners of the shops that were charging). So they had to close. We spoke to one gentleman who told us that he was involved in the running of the church and said that Solomon would be another 30 minutes. To my shame I could not wait any longer. As more people gathered i felt uneasy, I just wanted to get out. I gave the man many copies of John’s Gospel for them to use as a church. We got back into the van and drove through the crowds once more (this time with the van all locked). As we came out of the camp another scuffle was kicking off and I was relieved to be out of there. I stopped the van several times to check, check and check again that nobody was hanging on or underneath. We swiftly got back to the Eurotunnel and asked by the UK boarder Police where we had been. Their expressions changed when they were told.Lee had also lost his passport (which did not help matters). We were ushered to the side for a full search and drug swab. As we waited nervously, Lee found his passport which eased the situation and we were eventually allowed to go. We drove home in silence, shocked of what we had seen. We crossed the Severn Bridge in the early hours of Friday morning with a huge sigh of relief. I told Lee (Bilbo Baggins) that I did not want to leave the Shire again. I have left Calais with more questions than answers. The news does not give justice to the awful conditions that these poor people are living in and I must stress they continue to need our support. With that said I was also surprised by their ability to survive so long under tarpaulin surrounded by effluence and rubbish. In my brief time in the camp I can’t conclude whether these people were fleeing war or were simply economic migrants. What I will say is, whatever their motive, their move must be out of utter desperation for them to wish to endure these conditions. Many if not all wish to come to the UK, they have been sold a dream that makes waiting in the cold winter nights, all worthwhile. I have now defragmented my brain from yesterdays experience by writing the above and can thank God for His Grace. I was terrified in that camp, but in hindsight, we did get out in one piece, with not a single mark on the van (just a few hand prints). Although the “Jungle” has become tribal and self policing, they all have a shared respect for those helping them. There has not been one reported attack on any volunteer. I saw one young western female volunteer simply walking through the crowds on her own! Some of them even stay within the camp itself! Perhaps my fears were born out of what was an alien situation rather than any risk to self? With that said, I think I have made clear that it was an awful ordeal to experience and I would strongly recommend to the faint-hearted wishing to go, not to! Please use your resources donating funds instead! The volunteers are hard working and committed individuals and although would welcome anyone with open arms, are stretched as it is and do not have time for tourists. I was most surprised by how people were simply getting on with it, and many were dancing to music and quite jovial. Despite my horror of the conditions they were getting on with life, it was normal for them. They are resourceful, many have started businesses and offer services within the camp. The sad truth is, what I saw in the Jungle is the normal life experience of humanity. 2.8 Billion people in the world survive on less than $2 a day, 1.2 Billion people on less than $1 a day. By God’s Grace we are a fortunate few. We have received freely by birth a better life of much privilege, so have a duty to freely give to those less fortunate. A big thank you to; Torfaen Aid for Refugees, the members of Noddfa Baptist Church and Global Business Intelligence (GBI) who made the trip possible and a super big thank you to all those who donated. Pray for Paris – What does this mean? I was scrolling through Facebook over the weekend and saw nothing but support for France in light of the atrocities they’ve had to suffer at the hands of ISIS. It has been a tremendous display of solidarity. Many people have changed their profile pictures to show the French flag as well as give various messages of support. One such popular message is “Pray for Paris”. I have seen many of my non-Christian or nominal “friends” on Facebook share this meme and it is a wonderful gesture. But this does beg the question, why are those that have little to do with any religion at any other time suddenly have a desire to pray? And what does “Pray for Paris” mean to them? In Ecclesiastes 3:11 we are told that “God has put eternity in the heart of man,” because of this we (human beings) are all aware of the divine, we are all sentient beings, we are both body and soul. Which is why in times of crisis even the most ardent atheist has the propensity to look up and call for help. The act of prayer in itself is an acknowledgment of God (otherwise who are you talking to?) The act of prayer assumes that the gap between yourself and our creator has been bridged and that He has the capacity to hear and answer your prayers (and the millions of prayers He receives every minute of every day). Prayer is also an admittance of your own powerless state in a situation and the hope you have in God to help you. By the very act of praying for Paris, you are making huge assumptions that God will be listening, be empathetic and has the ability and desire to answer you. In affect the very act of prayer is an affirmation of the Gospel. Well it is only in the Gospel that we are told that in love God became flesh (John 1:14). It is only in the Gospel that we are told that God walked with us on this cursed earth and is thus empathetic to our trials (Hebrews 4:15). It is only in the Gospel that we are told that God died for us, and in His death on the cross (2 Corinthians 5:1) “bridged the gap” and reconciled us with Himself (Romans 5:10-11). It is only in the Gospel that we are told that God mediates for us (1 Timothy 2:5). It is only in the Gospel that we are told that God listens (1 John 5:14) and He can listen because He lives (Revelation 1:18). Various religions and cultures pray, but only the Christian Gospel meets the assumptions made by its very act. Please continue to Pray for Paris and keep praying for all those that are suffering. The Gospel is “the Good News” that you do not have to wait for a crisis to happen to speak to God. In Jesus Christ, God has made a way for us to speak with Him whenever we want to, what a privilege and a blessing. Enjoy it and Embrace it. We are very blessed in Abersychan to have such a committed and active Councillor as Giles Davies. He does so much for our community and his drive to make a difference to the area has not deteriorated since he took office as the Mayor of Torfaen earlier this year. Giles continually seeks to support all those in the area to the best of his ability, he is always out serving the community and I thank God for him. So, when I get a phone call from Giles, asking to support, I jump at the chance (and we all should)! I do not do this simply as assistant Chaplain to the Mayor, neither as a friend, but in gratitude for his efforts to improve the lives of all of us in the community. Giles has sacrificed a lot of his time and resources supporting his charities this year, and has worked incredibly hard to raise awareness for “World Pancreatic Cancer Day” (13th November 2015). I was humbled and excited to be part of the proceedings. 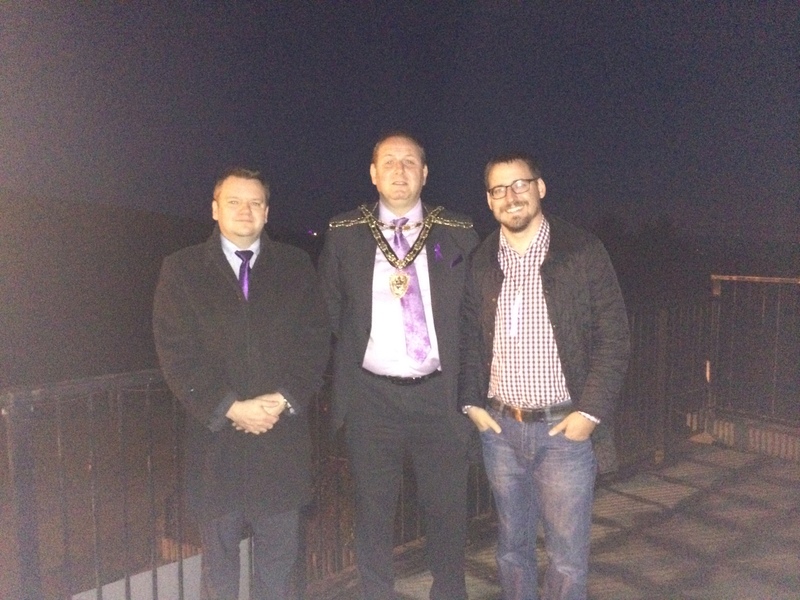 The charity event started at Pontypool Golf club where we met to see the Folly Tower lit up purple, it could be seen for miles. (I believe this is the first time it has been lit up since the millennium). 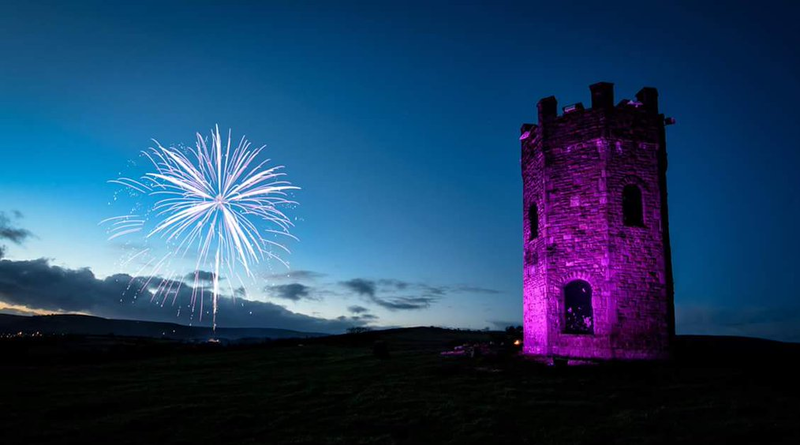 The lighting of the Tower was launched in spectacular fashion with the best firework display I have seen this year (courtesy of Pendragon Fireworks). 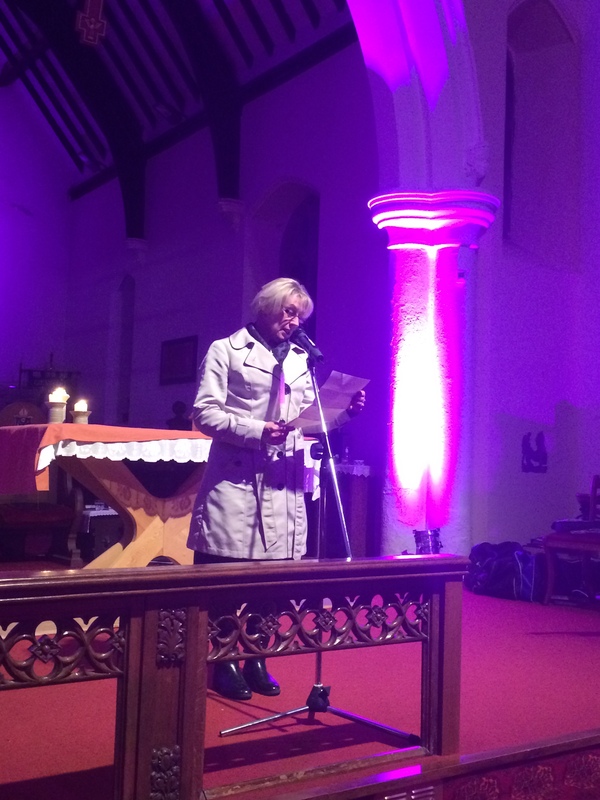 We then moved on to St Cradoc’s Church, Trevethin, for the “Purple Lights of Hope Service” given by Canon Brian Pippen. Prayers were said, candles lit to symbolise ongoing prayer for those suffering with Pancreatic Cancer and a well chosen reading from Romans 8:18-26. The reading from Paul’s letter talks about present suffering in a fallen world and the hope of Glory to come in Christ Jesus that will far outweigh our current pain and suffering. Then we enjoyed an evening of fantastic entertainment. 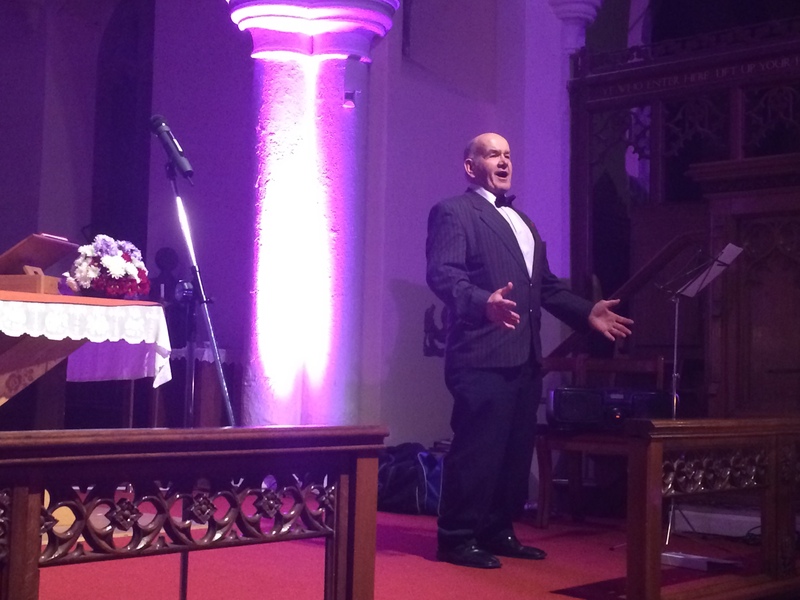 Howard Jackson sang from his heart (full of welsh pride), a mixture of traditional gospel songs and some classics to. Marvelous! We also had a scene from “AdHoc” dramatic group from their upcoming Christmas Carol show and a poem from Alex Wharton. The star of the show had to be Laura Sidney. 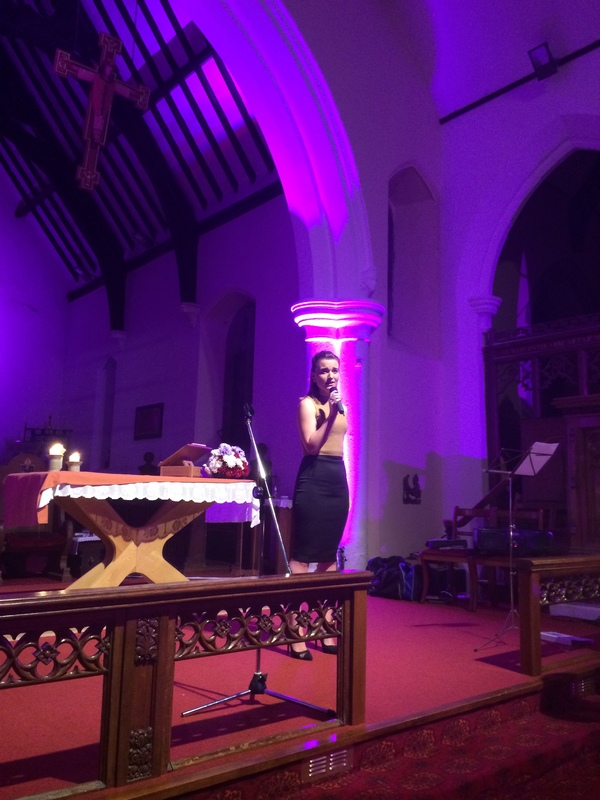 You do not expect to see such a talent at a local church in a small Valley town. Seriously world class. I closed my eyes as she sang and was carried away, a taste of heaven and something that she must pursue! The night ended with refreshments and fellowship, a great chance to meet many in the community and support a worthy cause. A big thanks to Giles, Mandy and all who supported.